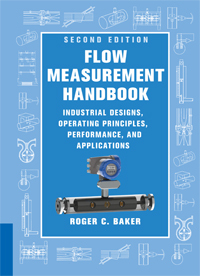 Flow Measurement Handbook is a reference for engineers on flow measurement techniques and instruments. It strikes a balance between laboratory ideas and the realities of field experience and provides practical advice on design, operation and performance of flowmeters. It begins with a review of essentials: accuracy, flow, selection and calibration methods. Each chapter is then devoted to a flowmeter class and includes information on design, application installation, calibration and operation. Among the flowmeters discussed are differential pressure devices such as orifice and Venturi, volumetric flowmeters such as positive displacement, turbine, vortex, electromagnetic, magnetic resonance, ultrasonic, acoustic, multiphase flowmeters and mass meters, such as thermal and Coriolis. There are also chapters on probes, verification and remote data access.